Hands-on workshops for researchers and students! 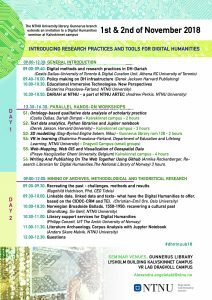 Introducing Research Practices and Tools for Digital Humanities. Is technology going fast for you, would you like to be able to use a tool and visualise your research or manage your meta-data? * GitHub can also be used to work on text documents? * GitHub enables collaboration on documents and software entirely through the web interface? * you can create a simple webpage with a few clicks through GitHub? * you don’t need any knowledge of the command-line version control tool ‘git’ to do all this? This course will teach you how to do all these things, and more. The seminar is aimed at graduate students, researchers and librarians, and tailored towards those with very little to no experience in the subjects taught. Experience with git or GitHub or similar services is not necessary. Time permitting, at the end of the workshop those interested can learn how to do the same operations using command line ‘git’. with Annika Rockenberger has a background in literary studies, European history, and communication science. She received her Ph.D. in philosophy of philology from the University of Oslo where she has been working since 2012. In 2013 she initiated the Oslo-based Digital Humanities network that lay the foundation of the Nordic Association for Digital Humanities (DHN) which she co-founded in 2015. She has been active as a DH ambassador in Norway and the Nordic Countries as well as in Europe. Since 2018 she is working as research librarian for digital humanities at the National Library of Norway. A unique possibility to meet Digital Humanities Scholars from renowned Universities with years of experience in research data management and Digital Scholarship. We have invited scholars from the University of Toronto, Harvard, UiO, the National Library of Oslo, UiT and NTNU to Trondheim for a two days seminar. They will share with us their DH projects and will be presenting as well their experience in working with DH infrastructures and tools and the challenges connected to that!